SeaLife is probably a company you never heard of in the camera industry. And when it comes to buying a rugged, waterproof camera – the DC2000 might not be the first camera to think of. But if you are looking for a compact camera that can go quite a few feet underwater, the DC2000 could be the one you are looking for. The camera has incredible features that might suit the qualities you want. It has an f/1.8 prime lens with a large 1-inch image sensor that produces images at 20MP. Yes, you read that correctly. So you can only imagine how pristine these images will come out. Aside from that, the price of the camera also includes an underwater housing that can go as deep as 200 feet. With the good, there are also some setbacks that can make you second guess your purchase. For example, the camera doesn’t allow zoom. 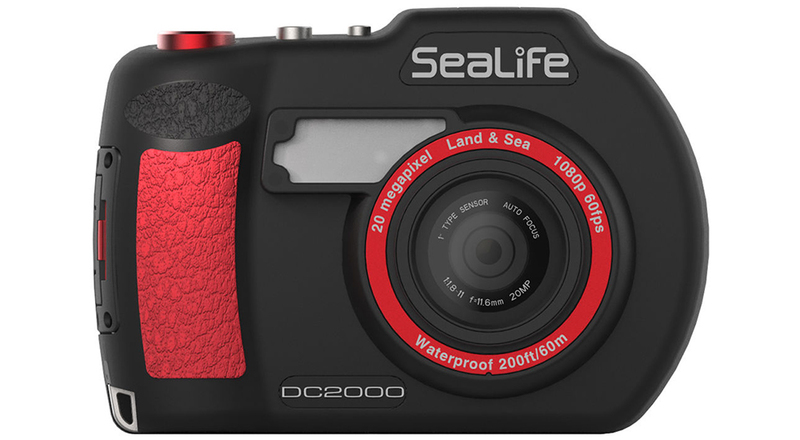 But before you dismiss the camera, let’s take a deeper look at what the SeaLife DC2000 has to offer. The SeaLife DC2000 is made to have the ability to handle tough situations. The compact camera is built with a sturdy metal exterior that is finished in a black coat with some red accents. It has been known to survive drops of about 5 feet and can go up to 60-feet underwater. And since the camera comes with an underwater housing, it’s great for serious scuba divers. Weighing at only 1.5 pounds, with the DC200 in it, it is convenient to bring along since it won’t weigh as much. The lens that you will be working with is an 11.6mm f/1.8 prime, which is similar to a 31mm on a full-frame system. It also has a slight wide angle feature that is a suitable focal length for travel and any situation when you want to casually shoot. If you want to shoot at a wider angle, you can purchase the Fisheye Wide Angle Lens, which widens the view to 19mm. There is also a macro setting that is convenient. This allows the DC2000 to lock on subjects just about 3.5 inches away from the lens. At the top of the camera are the power button, shutter release, and the record button. The Mode dial is on the back right-corner which consists of the standard PASM modes. There are also settings that are specialize for underwater shooting. Alongside the Mode dial is the Menu, Play, and WiFi. When you have the external housing added on, you won’t be able to access all controls. You can control the Mode but it is best to have the camera already set up before putting it inside the housing. In the housing, you can control the Flash, Focus, Menu, OK, and Play buttons which are oversized and easy to press. While in the housing, you might notice the flash soften as there is a grey window. If you are looking for a more powerful light, there is an external flash available or dive light. With the Link123 Plus app, you can transfer files and use it as a control for the DC2000. Although this app is available for use, it is also tricky to manage. By using the Wake Up function in the app, it will turn on the camera’s WiFi. Like many other cameras that have apps, you’ll be able to transfer your content to your smartphone or as a remote control for photos and record videos. From your smartphone app, you will only be able to control the EV and white balance. And unfortunately, Raw files are not supported within the app. The moment you turn on the camera, it will take about 3.1 seconds for it turn on, focus, and take a photo. The autofocus lags a bit as it takes 0.25-seconds to focus on a subject. As for continuous shooting, it is only available in JPG format but can take 6.2fps for up to 10 shots at a time. Putting the camera to shoot in Raw will slow down the camera, even with a fast memory card, as you will have to wait a few seconds after each shot. At f/1.8, each picture has 2,521 lines with a strong 20MP image sensor. If you turn down the aperture, each picture will become clearer with 2,970 lines at f/2.8. But once you hit f/11, it is best to avoid this aperture as it reduces the quality with 1,897 lines. There is no 4K video but the camera does record at 1080p at 30 or 60fps which gives you a clear resolution. It is also impressive how it is able to change focal points as the scene changes. But the audio isn’t the best as it can sound a bit distant and hollow. For those looking to have a tough, waterproof camera at hand, the DC2000 is a perfect choice. But it is crucial if having a zoom lens isn’t a necessity. If that’s the case, then don’t bother with this camera. Aside from that, the DC2000 can go great depths underwater on its own and then with the housing – it’s a great deal, especially since the housing comes with the purchase.